You’ll find epicurean delights here at Colonial Gardens Bed & Breakfast in Williamsburg, Virginia. Owner/innkeeper Karen takes pride and delight in her recipes and strives to provide a morning meal made with ingredients from right here on the farm. It was once said that nothing brings people together like a common enemy, which is true but not exactly the best way to bring people together. Now food, on the other hand, really can bring many different kinds of people together. If you sit a few people down who don’t know each other and tell them that the only thing they can talk about is food, you will have a conversation in seconds. Memories will start to be shared, then stories, and soon laughs. You can really tell a lot about a person when you start to talk about food. So next time you don’t know what to talk about, share a story about food. Everyone has to eat, so everyone has to relate to food in some way. Karen has a love of both food and bringing people together. So it is easy to see why our B&B has been such a success. Many of our breakfast dishes are created right here by Karen, and some are even demonstrated in our “In the Kitchen with Karen” video series. 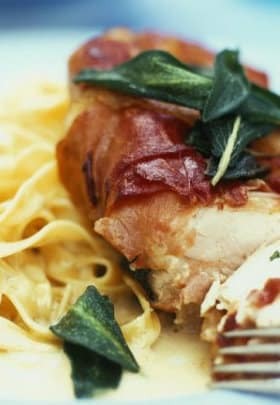 Our gourmet cooking classes are designed to teach the classic techniques along with many simple, but essential, tricks of the trade. You will learn scrumptious dishes using some of the season’s freshest ingredients and homegrown herbs. So check back every few months for new cooking classes where you can learn how to make fabulously decadent and impressive breakfast fare. 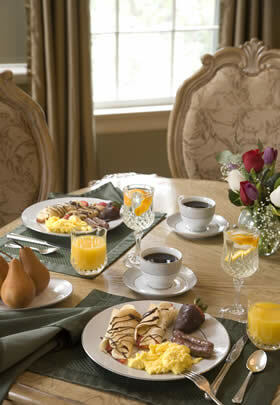 When you stay at Colonial Gardens Bed & Breakfast, a full gourmet breakfast is included with your room rate. Please note that breakfast is served at 9 a.m. As with most B&Bs, breakfast is served in one seating. If you would like to sleep late and miss our gourmet breakfast, please let us know the night before and we will make sure to have coffee, juice, and fruit available for you when you do rise. The innkeeper is a gourmet cook and can accommodate Vegan, Vegetarian, Low Fat, and gluten/dairy-free diets. Be sure to let us know in advance if you have special dietary requirements! All breakfast dishes served with coffee, tea, juice, and water. Apple Pie Pancakes – served with apple pie syrup, bacon and cheddar cheese scrambled eggs alongside fresh-cut apple wedges with sliced cheddar. Blueberry and Ricotta-stuffed French Toast – served with real blueberry syrup, baked cheese-stuffed eggs, link sausage alongside fresh blueberries and cantaloupe covered with a crumbled blueberry white English stilton cheese. French Crepes – served with a chocolate spread, fresh strawberries, and bananas topped with strawberry sauce, a hint of fudge sauce, and whipped cream with baked cream eggs and sausage patties alongside a chocolate-dipped strawberry. Eggs Benedict – served with homemade hollandaise with homegrown tarragon served with seasonal fruit. Strawberry and Cream Cheese-stuffed Croissant – drizzled with strawberry sauce and then baked for just enough time to melt the cream cheese and strawberries together… of course, it’s served with an egg and meat, but many just can’t see past those croissants! Lemon Pancake Rolls – these delicate lemon-flavored pancakes are rolled with a mascarpone cheese in the middle and served with fresh blueberries and blueberry syrup on top. Tarragon-laced scrambled egg and link sausage are served on the side for a perfect pairing. Chocolate French Toast with Raspberry Sauce – It really does not get much better than this. Layers of French toast are lightly browned before a fair amount of bittersweet Godiva chocolate is sandwiched between two of them. Once French toast is brought to a perfect golden brown, a homemade raspberry sauce is drizzled over them and large fresh raspberries are placed on top. Eggs for this dish are baked in cream in the oven to a delicate finish that keeps the egg whole and moist, yet completely cooked. This dish is served with triple-thick Smithfield bacon. One of the highlights of a Colonial Gardens Bed & Breakfast getaway is undoubtedly our full, gourmet breakfast, which is lovingly prepared by innkeepers Karen and/or Jennifer. Because our guests are so delighted by our culinary creations, we’d like to offer just one of the delicious recipes you may experience during your stay with us. Enjoy! After you have made the lemon curd, slice open a pocket in the croissants and fill with about 1 tablespoon of lemon curd. Add fresh raspberries and fill to your desired taste. Place on parchment paper and slide into a 325-degree oven for about 10 minutes; just long enough to warm everything up. Once out of the oven simply drizzle the raspberry syrup over the croissants and serve with eggs and meat of choice. Enjoy!